Sherlock: THE SIX THATCHERS Review | Warped Factor - Words in the Key of Geek. 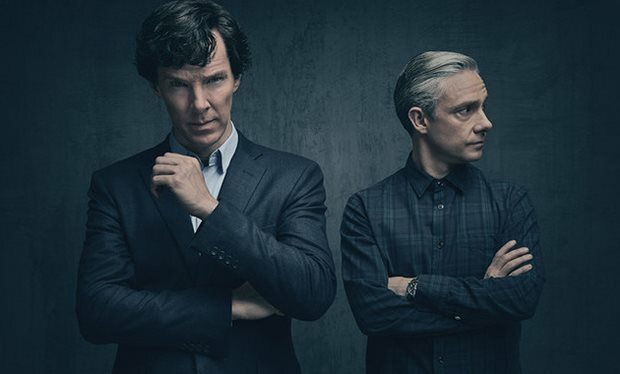 Series 4 of Sherlock opens with The Six Thatchers, synthesising sizeable chunks of the Conan Doyle short story The Six Napoleons, and then giving them the 21st century twist we expect from Moffat and Gatiss. Pre-credits, if we’re absolutely honest with ourselves, Sherlock seems almost entirely out of character, almost as though Gatiss wrote the dialogue for the Eleventh Doctor – all the talk of Ginger Nuts and Mivvis seems out of character even for a manic Sherlock, causing our faith to waver a little. There’s also a sense of Gatiss using heavy in-show referencing as a trailer for future episodes. Here there’s a heavy pulse of ‘Moriarty’ even though as far as anyone knows, he’s dead, and even though the story that unfolds at least appears to have nothing to do with him. The story with the exploding car and the mysterious corpse is intriguing enough in its own right, but is dispatched rapidly, in favour of Sherlock’s instant obsession with the smashed bust of Margaret Thatcher, a Napoleon of Political Crime unchallenged until at least January 2017. The TV episode follows the short story fairly closely inasmuch as Sherlock believes he’s searching for the black pearl of the Borgias hidden in one of six smashed Thatcher busts – it’s only when that line of logic comes to a shuddering halt in the brick wall of a familiar memory stick that things take a 21st century turn. Perversely, while that’s the point at which The Six Thatchers really becomes a proper Sherlock episode, it’s also the point at which things get a little self-revolving and tangential. The reality of the memory stick and its historical impact on the Watson family broadens the episode out far beyond the six Thatcher busts, and takes us far more into Mycroft Holmes’ world than Sherlock’s – this is Sherlock operating in the world of politics and espionage, assassins for hire and the quietest of political operators at the heart of government. Perhaps that’s why the episode feels a little off-kilter, Sherlock operating out of his normal sphere. Perhaps too it’s that The Six Napoleons is a short story, and the Six Thatchers is 90 minutes long, meaning to fill its run-time there has to be so much more in the TV version than the short story actually provides. Here the filler begins to show round about the point at which Mary begins her odyssey, even though the dip into her past and the search for the real reason that ‘AGRA’ was destroyed is an interesting story-thread in its own right. In its construction, The Six Thatchers reminds us of The Blind Banker, rather than self-contained stories like A Study In Pink, The Great Game or The Reichenbach Fall. It feels like a single thread that leads from one story to another, and a third within the scope of a single 90 minute episode. If you lock into it early on, that will feel logical and intriguing. But it also runs a fairly high risk of feeling like it needed one more thorough edit before recording, and of being unfocused and bloated. In terms of performances, and here we’re ready to be castigated and whipped through the streets of fandom, Cumberbatch plays Sherlock as more smug than ever before, pushing his deductive brilliance into any breaths given him by other characters. There seem to be only two explanations for his merciless self-name-dropping and run-on ‘look at me, I’m clever’ explanations to Ajay and to Vivien – either the ending’s a set-up and he’s in on it, or the smug summations of his own cleverness are there simply because Gatiss thinks no Sherlock episode’s complete without them. We actually don’t believe Gatiss would make that mistake – but that’s a conclusion that actively robs the ending of the impact for which it seems to genuinely be striving. At the same time though, this episode has Sherlock being almost a caricature of himself, lecturing Rosie Watson with lines from the original Holmes for comic effect, undercutting his own ability to function within the world of human beings. It’s a cute moment and no mistake, but the drop in to Victorian Holmes’ language seems absurdly noticeable, especially in a world where he’s the ‘only’ Sherlock Holmes, and is supposed to be just himself, rather than quoting from a Victorian antecedent. The really depressing thing in all this is that such things would normally be the grief-stricken rantings of someone close to Mary, someone who cared for her. In the world of Sherlock though, they’re the ramblings of viewers who’ve seen the boy cry wolf at least once too often. That intellectualising, that sense of having been taken for a ride when we’ve invested before, means there’s no way to win with Sherlock any more – we don’t get the emotional hit that the death of such a character should give us, because we’re trying to be Sherlock, all the while aware that Sherlock would have no problem believing that people just die, and that we’re not privy to the right information to allow us to make any kind of accurate judgment on it. It’s true of course that there are at least two instances within the episode of Sherlock playing with his audience in precisely this manner – the client whose wife left him, where Sherlock, apparently for cruelty and his own amusement, goes into a huge, overly complex plot involving Moriarty and then collapses the bubble with a single line about halitosis and underwear-theft, and the spiel when he turns up at the end of Mary’s odyssey, which turns out to be invented nonsense to cover the presence of the tracker on the memory stick. Both argue that sometimes, the simplest explanation is the one right before our eyes. But our ability to trust our eyes has been compromised by the history of the show itself. In other words, in any other show, the ending would have been a big, emotional cap to a long, seemingly sprawling episode that took us around the world and back in time to explain the threads that led from a broken bust of Margaret Thatcher to the compromising of an international assassination and clean-up crew. Most people might well still feel that impact. But this time out, with his on-screen reminders that ‘Most people are idiots,’ and the death of a brilliant character in a show that’s all about viewing the world intellectually rather than emotionally (and then stacking the deck so you can’t do so), Sherlock rather kills its own potential impact. Are we saying this is that oddest of things, a bad episode of Sherlock? No, absolutely not – there was plenty to like, and the plot was still better constructed than (perversely) episodes like The Baskerville Hound and The Blind Banker, but if Series 4, Episode 1 had needed to play an absolute blinder in order to keep fans with it, it would have missed enough of the mark to start questions being asked. Fortunately of course, Series 4, Episode 1 needed nothing of the sort, and the trailer for the two episodes to come looks as though they take the great detective into darker, harder hitting territory. It may not have been perfect on transmission, but there may yet be more to The Six Thatchers than has yet met the eye. Rejoice, Sherlock-fans. The frustration and the fun have returned.